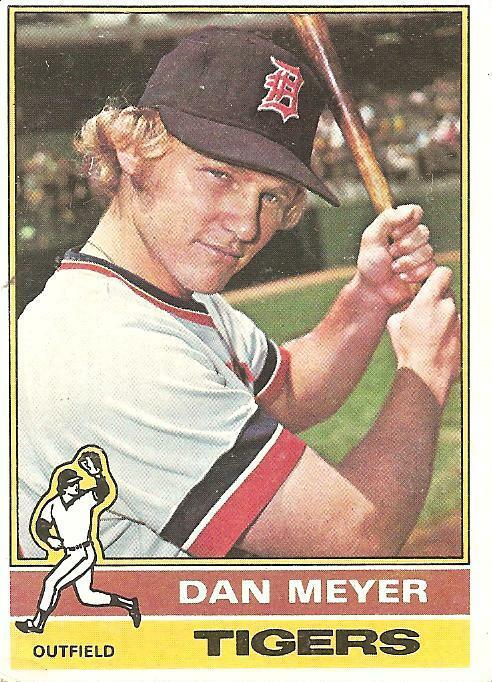 If the photo on this 1976 card is any guide, I think Dan Meyer may have missed his calling. Replace the bat in his hand with, say, an umbrella, replace the Tigers-related regalia with a cozy-looking turtleneck sweater and a corduroy cap, and airbrush the background from a hazy baseball scene to a misty beach or some leafy trees, slap the photo on an album cover with a title like “Dan Meyer: Feelin’ You Feel” or “Dan Meyer: To Be Your Friend Is What I Wanna Be” or “Dan Meyer: Hold Me Tight Today” and you could stroll up the top 100 on the 1976 charts like Hitler rolling into Czechoslovakia. Years later, instead of being the fodder for some middle-aged creep writing about his childhood baseball cards, Dan Meyer could be featured in a brief clip on an oddly mesmerizing late night infomercial, hosted by two frighteningly mellow members of Air Supply and a large pitcher of never-touched, presumably toxic lemonade, for a several-CD set of Soft Rock love songs. Oh Dan Meyer, had you chosen the path suggested by the photo on this card, insomniacs pushing fifty would now be happening upon the infomercial as they flipped for some safe television haven and would be so moved by the shred of one of your long-forgotten sugary ditties and the memory of it playing on an AM station on the transistor radio as virginity was released beneath the bleachers in the summer of 1976 that installment-based purchase of the set of CDs would be seriously contemplated before being dismissed as a significant and unretractable first step toward doddering senility. Alas, Dan Meyer stuck with baseball. It’s not as if he did so without cause. He had begun his pro career with a bang, at 19, tearing up the Appalachian League in 1972 with a .396 average. Within two years, he had reached the majors, swatting three home runs in 13 games during a September 1974 call-up. He became a regular the following year, splitting time between left field and first base on a putrid 102-loss Tigers squad. Meyer’s playing time decreased the following year, as the Tigers showed some signs of life on the wings of All-Star Game starters Mark Fidrych, Ron LeFlore, and Rusty Staub. At the conclusion of the season, the Tigers, along with every other American League team, had to decide which players they wanted to protect from possible selection in the November 1976 expansion draft that would channel bodies onto the rosters of the two brand new AL franchises, the Toronto Blue Jays and Seattle Mariners. In this 1976 card, cuddly would-be AM radio mainstay Dan Meyer is of course unaware that he is about to be deemed expendable. As the photo was probably taken sometime in 1975, he wouldn’t have even been able to see the faint writing on the wall that came with the Tigers selecting USC superstar Steve Kemp with the first overall pick of the 1976 amateur draft in January of 1976. Kemp joined a growing stable of young left-handed sluggers that also included Jason Thompson and Ben Oglivie and that made Dan Meyer, who must have seemed a promising part of the Tigers future back in his pro debut season of 1972, into excess baggage. The Tigers left him unprotected and the Mariners snatched him up with the ninth pick of the expansion draft. Meyer seems to have epitomized the Mariners’ drafting strategy, which produced a plodding first-year team that rode its ability to hit the ball over the fence with some frequency to a finish that left them atop not only their fellow expansionists the Blue Jays in wins but also above the recently mighty Oakland A’s. Dan Meyer hit 22 homers and tied for the Mariner lead in RBI that first season (he and Leroy Stanton both had 90). That proved to be the peak of his career, though he did top the 20 home run mark one more time, in 1979, and stuck around in the majors for twelve seasons in all. I don’t know what else to say about him. He didn’t strike out much. Meanwhile, the Mariners languished for years after the expansion draft, while their fellow newcomers, the Blue Jays, absorbed the blow of a few horrendous seasons while building for the future, which arrived in the mid-1980s, when the team became a contender for the next decade. So really there are three teams that can be explored through Dan Meyer. The Tigers got rid of him and began a rise to the top of the standings that crested with a World Series championship in 1984. The Blue Jays neglected to take him and generally shied away from reaching for unwanted sluggers and gradually built from within until becoming an AL East powerhouse. And the Mariners took him and scuffled along without a discernable team-building philosophy for many years, and though they’ve had their moments they still have as many World Series appearances today as they had the day that Dan Meyer became a Mariner. It could have been so different, if not for the Mariners then at least for Dan Meyer. There could have been a Dan Meyer song stuck in your head right now, driving you slowly and softly insane. You are currently browsing the archives for the Dan Meyer category.